Gunnar and his mom Kristie. Marquette, MI – May 14, 2018 – 103-FXD’s staff recently got a chance to talk with a Michigan resident about her experiences with St. Jude when dealing with her son’s cancer. As we gear up for the annual St. Jude RadioThon, we want to help share Kristie Charvat’s story and the incredible acts St. Jude Children’s Research Hospital achieves every day. Kristie Charvat’s father was born and raised in the U.P. and her family lives downstate in the Flint area. Her first child, Gunnar, was born in August 2015 and by April of 2016, Kristie and her husband knew there was something wrong with their baby boy. At eight months old little Gunnar began throwing up for no apparent reason and had constant fevers. After weeks of their child being sick and no answers from regular doctors, Gunnar expelled something from his urethra. In a panic, Kristie took her son and the unknown substance to a their doctor. After this scary moment, the doctor and family scheduled an ultrasound which relieved a large mass on Gunnar’s bladder – Rhabdomyosarcoma. Kristie recalled that her heart sunk. She didn’t know what ‘Rhabdomyo’ meant, but she new sarcoma was cancer. Kristie told 103-FXD staff that a lot of the mother’s called cancer a monster inside their children. “It’s a monster. It’s coming at your in the dark and you don’t know what to do or how to seek treatment,” she said. When asked how she choose to go to St. Jude, Kristie explained that she had previously studied in the medical field and always new about St. Jude. She actually hoped to work at the hospital some day. She had no idea that she would be going to St. Jude, but to fight for her little boy’s life instead. After getting a referral from Gunnar’s doctor in Michigan, St. Jude accepted Gunnar immediately. Rhabdomyosarcoma is a very rare form of cancer that only appears in about 350 children per year. This cancer is most often seen in children under the age of five. Gunnar and Kristie stayed at the Ronald McDonald House for five to six months before moving to the Target House, a long term stay facility. The hospital gave them a two bedroom apartment at the Target House in a complex with many other families. Being at the Target House gave Kristie and Gunnar the chance to meet other families dealing with cancer. There were many activities very week that kept the kids and adults connected. There were dinners set up for the families, even a St. Patrick’s Day party with real Irish Dancers! Kristie was amazing how easy it was to meet other families. Donate to St. Jude to help save lives like Gunnar’s. While there was a lot of good memories from St. Jude, there was still the fact that Gunnar had cancer. He endured 48 weeks of chemotherapy while taking three different types of medication. His health was so bad at one point that St. Jude actually admitted him over night into their hospital. St. Jude Children’s Research Hospital does everything that can to help save children. 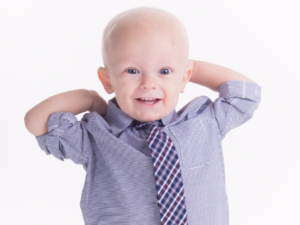 The doctors at St. Jude pulled strings to get Gunnar into a facility in Jacksonville, Florida for 6 weeks of a proton beam radiation, because their own system was not set up yet. After 11 months, Gunnar and his mother left Memphis to return to Michigan. Gunnar was in remission. Today, Gunnar is 3 years old, going to be 4 in August. He is a big brother to one, with another sibling on the way. Kristie said he is a little spit fire. He is full of life and nothing is stopping him. “Gunnar continues to be a normal kid.